This week I am in Utah! My amazing sister is a wonderful author (Tess Hilmo) who writes young reader books (that are amazing!). 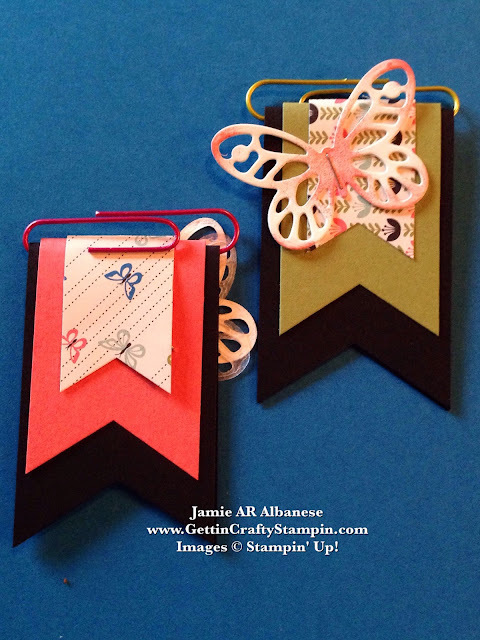 We both have the reading passion gene... so for a 3D Swap this week (at Inspire, Create, Share the Stampin' Up! Convention) I am swaping these hand-crafted butterfly book marks!! Super easy and fun... see how to create and bookmark some crafting in your life! The new Banner Triple punch is a great tool everyone needs!! I love it! Here creating three banners using the punch in 2", 1-1/2" and 1" I actually cut and scored the card stock - punching the edges at the same time!! Banners are so fun, on trend and easy to use in crafting! Add color when you use the Dauber in the Calypso Coral ink pad for a coordinated look. Using the Handheld Stapler is ideal as it has a longer reach and smaller stapler all of which is perfect for crafting!! 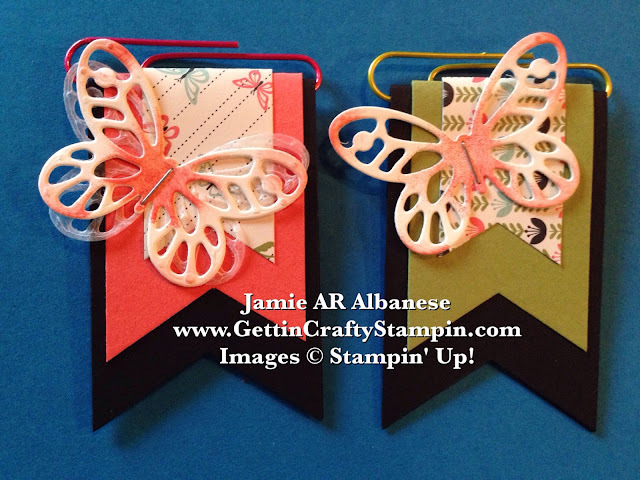 I stamped the butterfly pieces onto the banner punched pieces that I'd threaded onto the paper clip. Covering the staple (to protect fingers and books) with the last banner is a simple technique that is easy to do. Go ahead, do it... bookmark some crafting fun with ME! While I'm in Utah (it's so beautiful here!!) and living up the land, family then joining 4,000 stampers at the upcoming Inspire, Create and Share convention - I'm also planning the most amazing Card Making Buffet class that will have all of my goodies from convention to preview and play with (RSVP ASAP for the 31st). 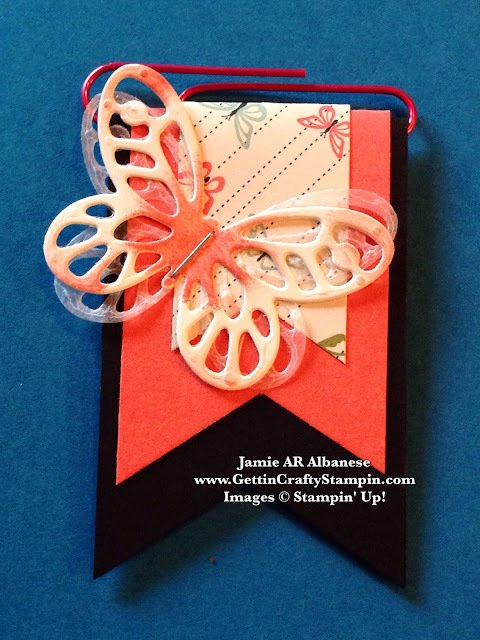 I'm excited to create this hand-crafted butterfly bookmark for those coming to my upcoming classes - perfect to use in the Idea Book and Catalog or in their every-day reading! !